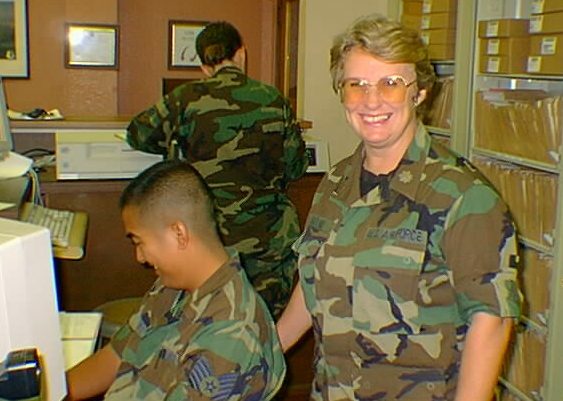 This photograph show then-SSgt Joseph Ramos and then-Maj Susan Higgins in the early 1990s. The Consolidated Base Personnel Office (CBPO) as it was known back then was located on the second floor of the supply building. The CBPO was renamed the 154th Mission Support Flight (154 MSF) when the function relocated to the current Mission Support building. The 154 MSF recently merged with the 154th Services Flight and in now known as the 154th Force Support Squadron.